Ochs und Junior continue on their highly individualistic and minimalist approach to watches with the launch of the new ‘day/ night’, conceptualised and designed by Dr. Ludwig Oechslin. 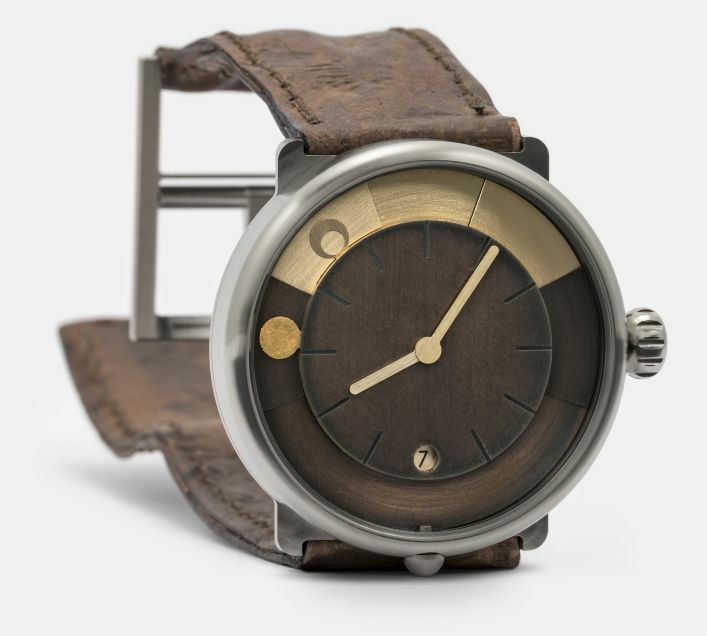 This is not a watch with a typical ‘day/ night indicator’. This is a watch which will tell you how much time there is until sunrise/ sunset, made for your location. 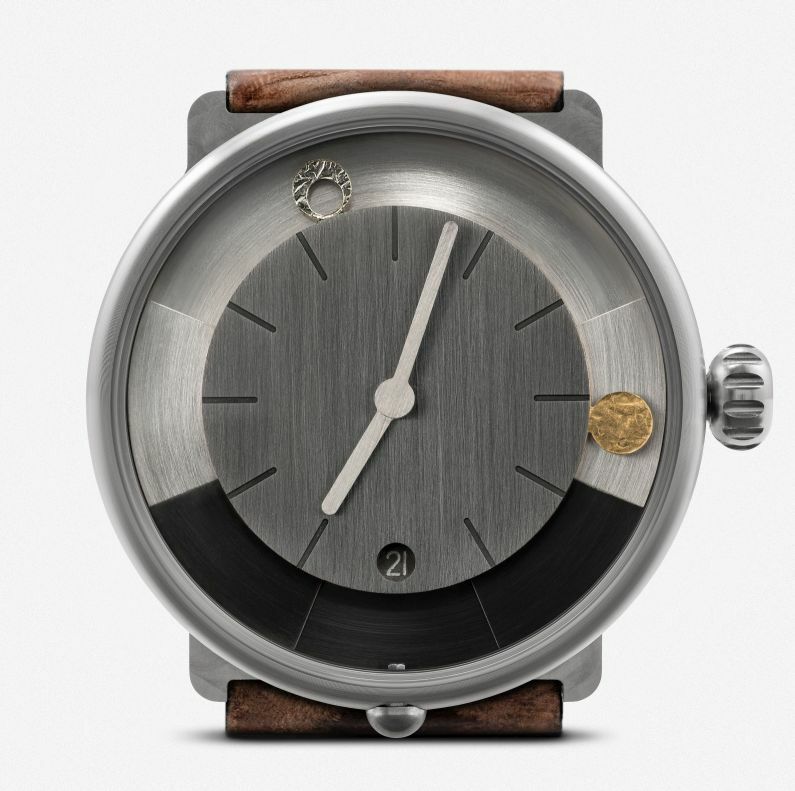 They say that this is the first time such a feature has appeared on a wristwatch. 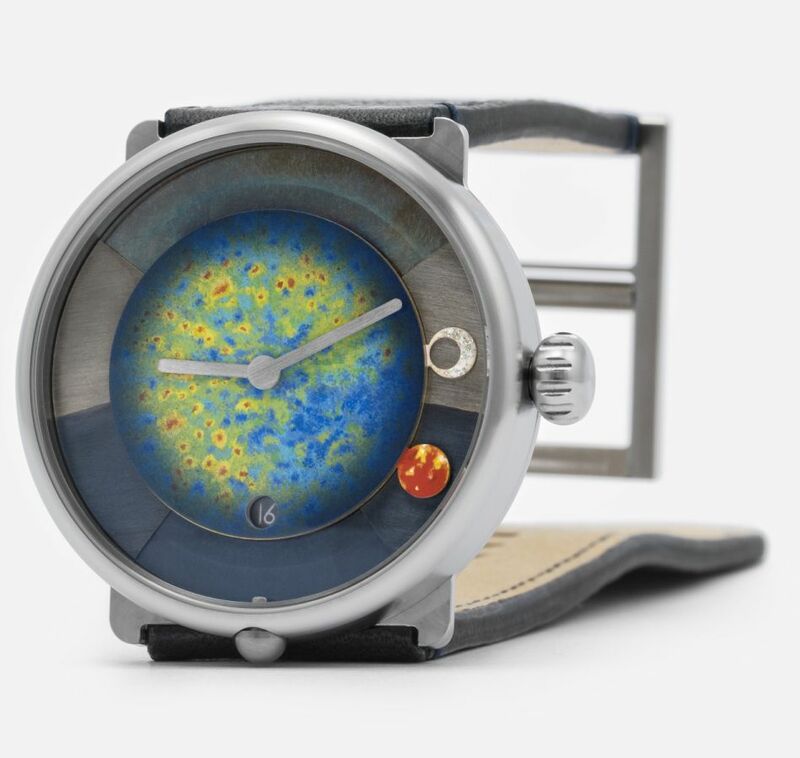 In a nutshell, apart from the time and date, the functions/ indications on this watch are the solar noon, sunrise/ sunset, a moonphase, and the positions of the sun and moon in the sky for your chosen location. Since the lengths of day and night vary according to one’s position, the watch is manufactured specifically to the location/ co-ordinates requested by the customer. The light and dark-colored areas around the dial show the length of day and night respectively, with the line separating them representing the horizon. Sunrise is when the sun passes from the darker colored area of the dial into the lighter colored area, and sunset is when the sun passes from the lighter colored area to the darker colored area. The horizon fans move up or down every 10 days to account for seasonal changes. The moon’s position in relation to the sun indicates the moon phase. When the moon is beneath the sun, it is new moon, when the moon is opposite the sun, it is a full moon. Because the sun and the moon’s positions depend on one’s position, the day/ night difference is more pronounced the further one moves away from the Equator. The rounded pusher near the 6 o’clock marker is to set ‘true (solar) noon’ (when the sun is at its highest point), and switch between daylight savings and standard time. The base movement is an Ulysse Nardin Calibre UN-320 with 39 jewels beating at 28,800VPH, and a power reserve of 50 hours. Transparency by brands in terms of who makes/ supplies parts is always a welcome thing, and for the day/night, Ochs und Junior list their suppliers/ makers for everything, from the case or crown (designed by Ludwig Oechslin, with the Grade 5 titanium one made by Pibor SA and the sterling silver 925, by Helfenstein Mechanik AG) to the sapphire crystal, base movement, and even the source of their Super-LumiNova. The best way to understand the day/ night is to watch this video by Ochs und Junior co-founder Beat Weinmann. The two-part case designed by Ludwig Oechslin is 40mm, with a thickness of 11mm, although a 43mm version is available on request. 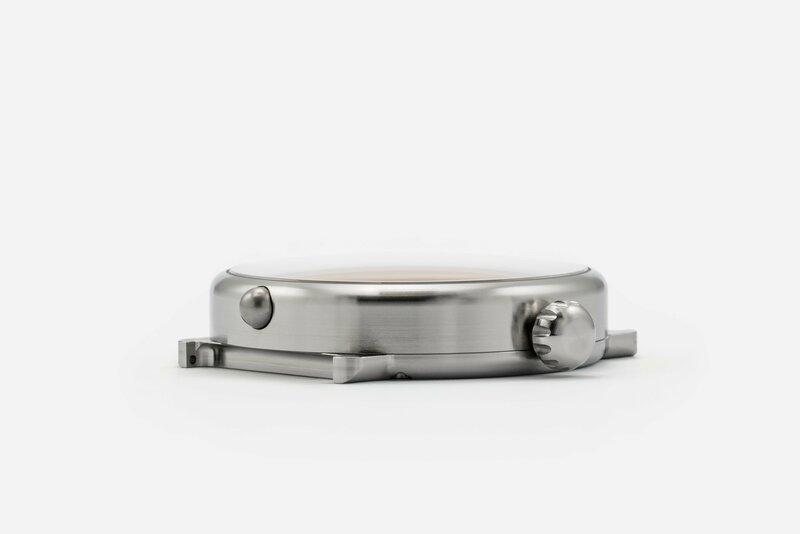 The case is in either Grade 5 titanium or sterling silver but again, there are additional materials available upon request. They have a solid case back and the water resistance is 50m for the titanium cases and 30m for the sterling silver 925 cases. The cases are made by Helfenstein Mechanik AG in Alpnach, Switzerland. 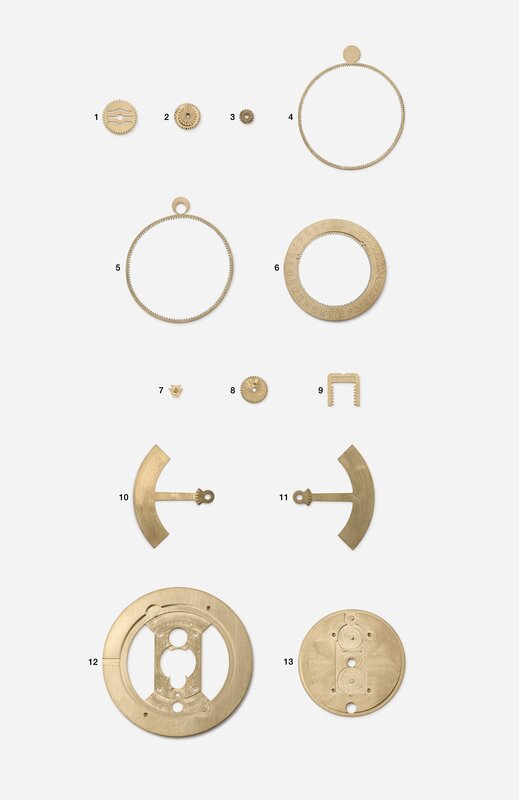 In fact the gear systems, dials, hands, cases, buckles, and crowns, are all made by the Helfenstein Mechanik. The watches are hand-assembled and regulated at Ochs und Junior in Lucerne. There are over 80 strap options available, on a the buckle designed by Ludwig Oechslin in the matching metal. Each day/night watch is sold directly by Ochs und Junior. You can choose from the default models, design your own through their online customiser, or even contact them directly if you have some ideas that aren’t covered by their online options. Prices start at 14,850 CHF. As mentioned earlier, in addition to the watch’s two year guarantee, there there is lifetime warranty on all parts within it that were invented by Ludwig Oechslin. Although custom made to your location, don’t worry if you move say from Lucerne to Sydney. Ochs und Junior have factored this in and can quickly and easily change it for your new location by exchanging a single adjusted gearwheel. To order one and/ or play with the customiser, hit this link.